NATIONWIDE: More than 6,650 drivers, most of whom were intoxicated over the New Year festival, are being forced to do community service for dangerous driving. 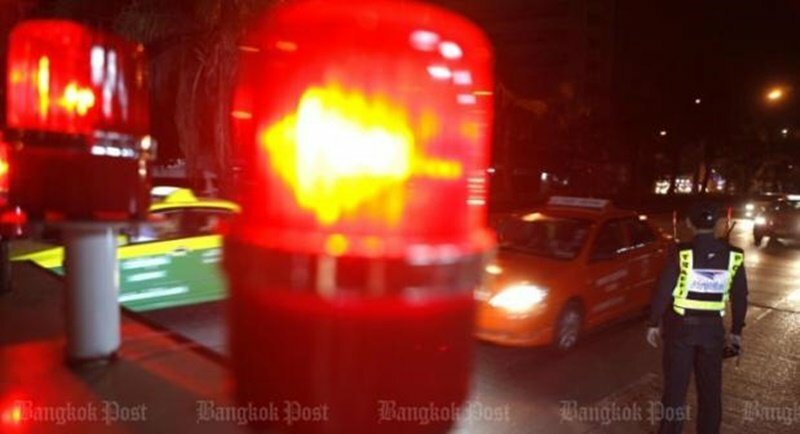 Drink driving accounted for 90.3% of total cases, while other traffic violations included careless driving and driving under the influence of drugs, Probation Department chief Prasarn Mahaleetrakul said yesterday (Jan 8). Officials also found a number of the drivers had committed similar offences during the New Year holiday last year. “The number of repeat offenders increased by ninety nine,” Mr Prasarn said. The courts have put all traffic law violators on probation for between one and two years during which they are required to perform 21 hours of community service on average, attend traffic training classes and report to probation officers on a regular basis. Some 295 motorists also had their driving licences suspended. Mr Prasarn said he plans to have repeat offenders take care of drink driving victims, mostly bed-ridden patients, in the hope that seeing their suffering will help change their behaviour. This kind of community service will hopefully steer them toward driving more carefully once they see the victims of these crimes, many of whom were disabled, said Chetsada Yaemsabai of the Don’t Drive Drunk Foundation. He himself was left crippled by a drunk driver following an accident 15 years ago. In Bangkok alone, more than 1,000 people have also been left crippled as a result of drink driving. Mr Chetsada sees himself as a “burden” on his family and spends most of his time at home because of limited mobility and takes medication costing B100 per day. Phakdi Sonprathet, who was once prosecuted for drink-driving, supports the move to have wrongdoers take care of victims and see first-hand the consequences of their actions. “I really felt remorse when seeing how they suffered,” he said when talking about when he had to perform community service. “Some cannot use their hands, so I had to hand-feed them,” he said. As a result of what he saw, he decided to turn his back on alcohol. Those motorists who find they cannot keep their drinking in check need to go into rehab, Mr Prasarn said. He said he does not think the high number of drink drivers over the New Year festival resulted from more alcohol consumption. He thought the figures reflected stricter measures to curb road accidents during the long holidays. Meanwhile, police and Chulalongkorn University rolled out “nano-technology crash helmets” for a campaign aimed at encouraging people riding pillion to wear helmets. Many motorcycle taxi passengers often refuse to wear helmets because they regard them as smelly and unclean. Chulalongkorn researchers, however, say they have solved the problem by using nanotechnology to coat the inside of helmets to make them germ free, Chulalongkorn University’s deputy rector Napbun Huncharoen said. The university will test the new crash helmets by handing out 300 to motorcycle taxis operating around the university campus and nearby Siam Square, he said. This should help boost government attempts to have all people riding motorcycles wear a crash helmet, deputy national police chief Wirachai Songmetta said. The university and police are also offering to clean people’s crash helmets, Gen Wirachai added. Motorcycle riders can visit a service point located at Chaloem Phao intersection near Wat Pathum Wanaram on Rama I Rd.